Celebrating Kindergarten Writers at Wing! 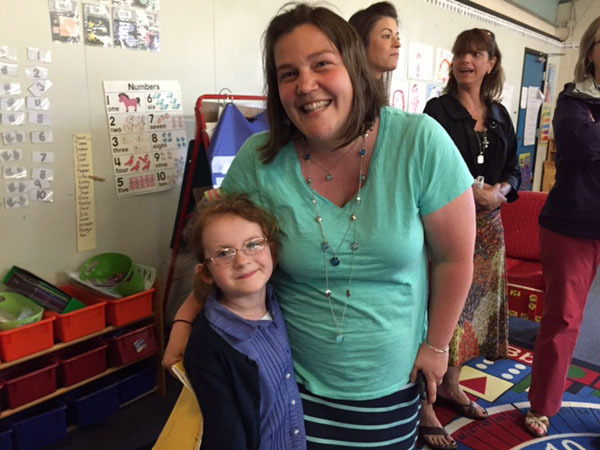 Posted on May 21, 2015 by Sandwich Learns Together/ SPS in Celebrate SPS! 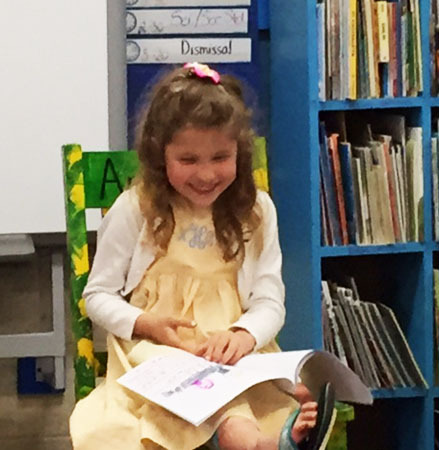 The Wing School Kindergartens hosted a special event for families. The teachers share their thoughts, and some photos from the evening, below. Since the first year of Matt Bridge’s principalship at the Wing School, the kindergarten class has buried a time capsule under a newly planted tree. The time capsule was opened by the students as part of their 8th grade celebrations. With the closing of the school this year, the kindergarten teachers wanted to do something special for the kindergarteners and we wanted to showcase the talents of our students. 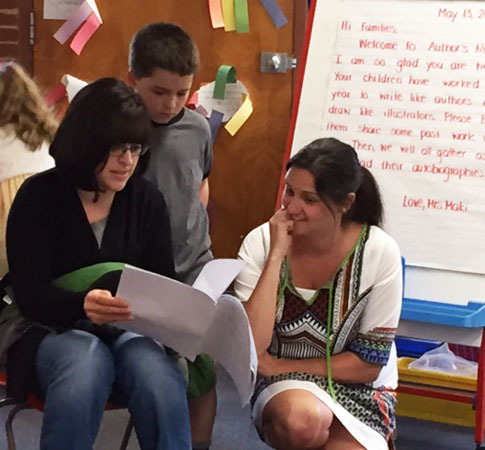 We decided to show families what we had been doing during our Writer’s Workshop by having an Authors’ Night. At first, I was hesitant about the logistics and if I had enough samples to make it through the hour. I can honestly say, this was the first (and hopefully not the last) time that I planned an event and everything went exactly as expected. It was lovely and wonderful. Mom and teacher appreciating the author’s craft! I had been saving various samples of work from each student,fiction pieces, how-to stories, friendly letters, responses to writing and most recently, we had just finished our autobiographies. They were great! Various types of work were displayed in different sections of the classroom to encourage families to walk around have other students share with them as well. At each child’s table space, they chose three pieces to share individually with their families. About half-way through, everyone was invited to join us at the rug. I hadn’t placed the chairs out yet as we were using them at the tables. Sharing his work with all the families. As I called everyone over, an amazing thing happened. Parents sat down, children sat in their laps and everyone listened. Our authors were able to share their stories and it was wonderful! I mean truly wonderful. It was such a nice way to end the year. Families were able to see the growth in their child’s writing, children were able to share their learning and show how they applied it to their writing, and we came together as a group to praise the hard work of all. 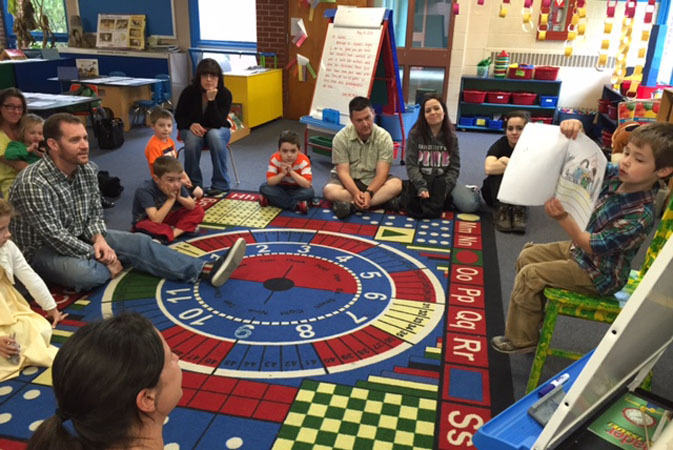 Our cozy kindergarten circle included families that evening and it felt so special. To launch our Autobiography Writing Unit, we began by studying biographies of famous people which kids really enjoyed. We read about Einstein and MLK and Amelia Earhart, to name a few. We discussed and charted what we learned in those biographies – especially what features they had in common – example: almost all of the biographies began with when and where the person was born and who was in their family. So we took note of that and when we did our autobiographies / biographies, that is how we began too. We also noted that many biographies noted something that the person had done that made them proud, so we included that in our work as well. Our students realize that they can learn how to write a book by noticing what published authors do. And soon enough, they will be published authors as well! My students had so much fun learning about each other and were very enthusiastic about this type of writing in general. 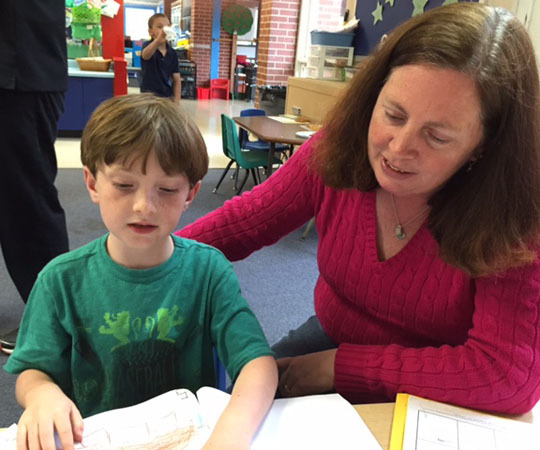 A talented young author reads to his proud mom. It is always so exciting to witness the journey of these young writers.To look back at where they started to where they are now is incredible. Some children enter kindergarten and do not even know their letters, but leave writing stories in the genres we study. I find that the more we immerse the children in the different genres of writing (autobiographies, biographies, informational text, fiction and poetry etc) the more they take on themselves. This time of year is the most exciting because the children begin to edit their own work, they ask for more pages because they forgot a step, or they go back and add a table of contents because that is what they have seen other authors do in that genre. Seeing the children progress through the year and their excitement about sharing their writing is what makes my job so wonderful and rewarding.